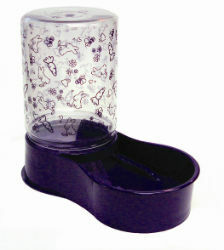 This feeder has a reversible base, use one side for food and the other for water. Unique design allows you to keep food fresher longer. Reservoir twists effortlessly into place. Ideal for small animal pens or cages. Two founts nest so it takes less retail shelf space.